Using the medicine for another purpose, such as getting "high"
Research from the Partnership for Drug Free Kids shows that one in four teens has misused or abused a prescription drug at least once in their lifetime. That is a 33 percent increase since 2008. Even more concerning, other research conducted by Partnership for Drug-Free Kids shows that parents are not communicating the risks of prescription drug abuse to their children as often as they talk about illegal drugs. This is partly because some of us are unaware of the behavior (it wasn’t as prevalent when they were teenagers). Finally, the same study showed that 28% of parents have themselves taken a prescription drug without having a prescription for it themselves. This is not necessarily abuse, but it sets a dangerous example for kids – that the recommended dosage of prescriptions need not be strictly followed. As with other forms of substance abuse, there are a variety of driving forces. Reasons may include partying or getting high, in some cases, but also “managing” or “regulating” their lives. They’re abusing some stimulants such as Ritalin and Adderall to give them additional energy or ability to focus when they’re studying or taking tests. They’re abusing pain relievers like OxyContin and tranquilizers such as Xanax to cope with academic, social or emotional stress. They’re abusing prescription amphetamines to lose weight, or prescription steroids to bulk up. 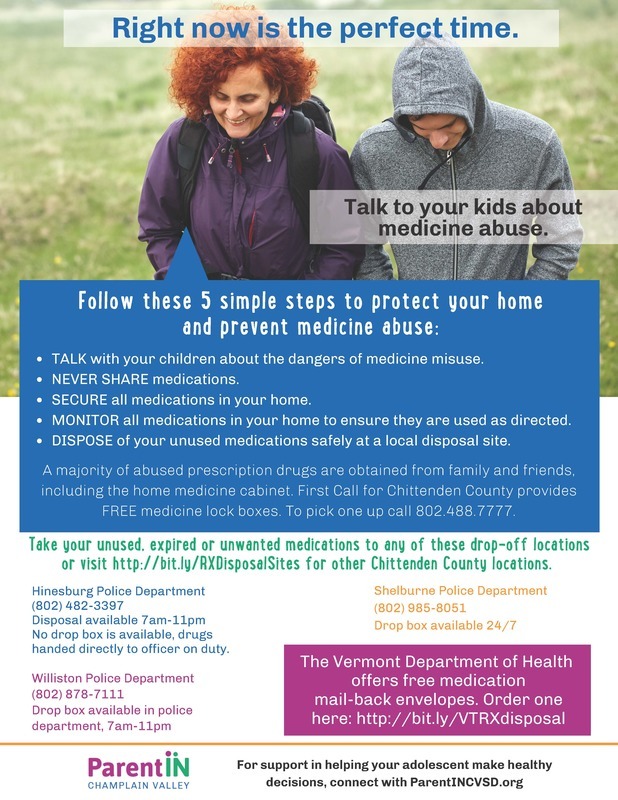 Talk early and often...Communicate the risks of prescription drug abuse to your kids. Children who learn a lot about the risks of drugs are up to 50% less likely to use drugs. Safeguard your own medicines. Keep prescription medicine in a secure place, know how many you have and properly dispose of unused and out of date medications. Role model appropriate use of prescribed medications. Waterbury, Vt. – As part of National Prescription Drug Take Back Day, Vermonters disposed of almost 3 tons of unused medications, including prescription opioids, on Saturday, October 28th . From the 72 collection sites throughout Vermont, a total of 5,913 pounds of Vermont’s “most dangerous leftovers” were collected and will soon be destroyed. Saturday’s collection of medications exceeded the 5,552 pounds of medication collected last April. The Drug Enforcement Administration (DEA) estimates that approximately 10 percent of the medications collected on Prescription Drug Take Back Days are opioids. National Prescription Drug Take Back Day is an initiative lead by the DEA in conjunction with the Vermont Department of Health and state and local law enforcement to collect and destroy unused medications, including prescription opioids. The misuse of drugs often begins at the family medicine cabinet, where prescription painkillers may be kept long after they are needed. As part of Saturday’s collection event, communities throughout Vermont hosted collection sites where people safely – and anonymously – dropped off unused medications. The sites were staffed by local and state police and county sheriff departments. The 72 collection sites around Vermont were the most collections sites the state has established for a take back day. “Getting rid of unused prescription opioids is an important piece of the puzzle in solving this state-wide crisis,” said Commissioner Thomas D. Anderson. “Recent studies indicate that between 42% and 71% of opioids prescribed in connection with surgical procedures go unused. It is therefore critical that these unused opioids are destroyed before they can be diverted for non-medical use,” commented Anderson. Commissioner Anderson also thanked the DEA for its leadership of this program and Sheriff Roger Marcoux for his tireless efforts in supporting the removal of these “most dangerous leftovers.” He also expressed thanks to the Vermont State Police, the numerous local police departments, the Vermont Health Department, and area businesses that participated in and helped make National Prescription Drug Take Back Day a success.